There are a couple of different ways I aerate the compost in the Geobin Composter. One is more labor intensive and I only do it once a year. The other is easier and I do it more regularly throughout the year. I'll go over both methods. I could probably compost a little better. I'm not sure if what I'm doing is right but this is what I do and this is the method that works for me. It's a somewhat hybrid of active and passive composting. 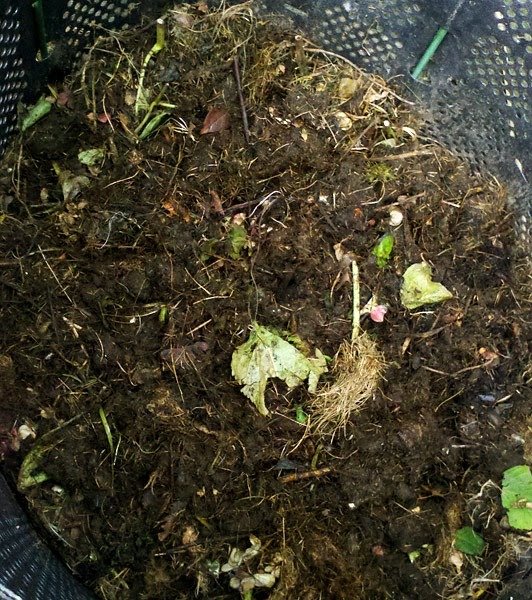 In the spring I empty out the compost from the Geobin and spread it around the garden beds. 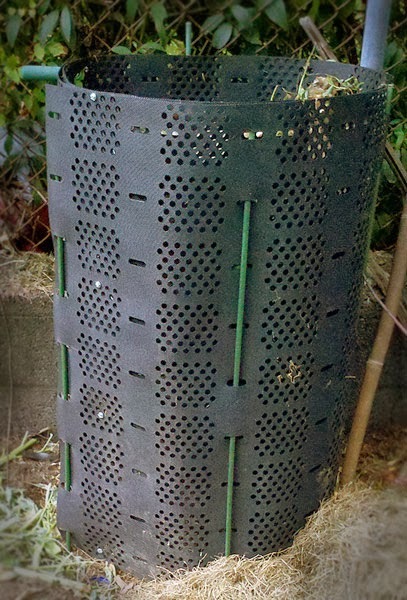 With the Geobin empty, I also make it smaller since there isn't much material to compost and I want to conserve space. I double it over onto itself so it is half its maximum size. This is a good size for me. Anything that didn't compost thoroughly over the winter gets thrown back into the bin as well as whatever random clippings gathered from the spring garden clean-up. Over the course of the growing season it mainly acts as a place to dump compostable material. Material is added a little bit here and there when it comes up. I mulch mow my grass clippings so there isn't much that goes in it other than coffee grounds, filters, eggshells and fruit and vegetable scraps this time of year. Plus the occasional pulled weed or pruned plant debris. 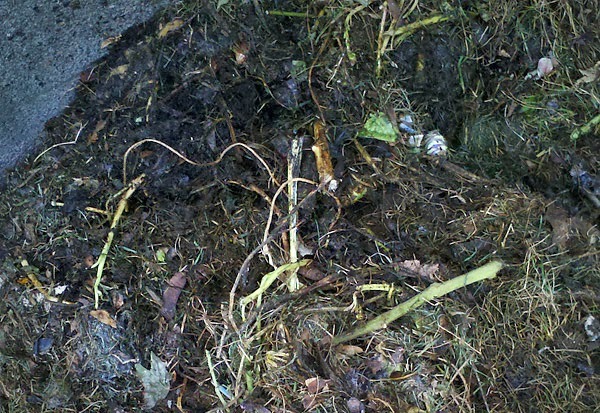 I try to keep twigs, branches and other items that take a while to compost out of the bin. Once a week (sometimes more, sometimes less) I'll turn the compost with a Yard Butler Compost Turner . It's a tool that has a couple of folding wings on the end of a metal rod. 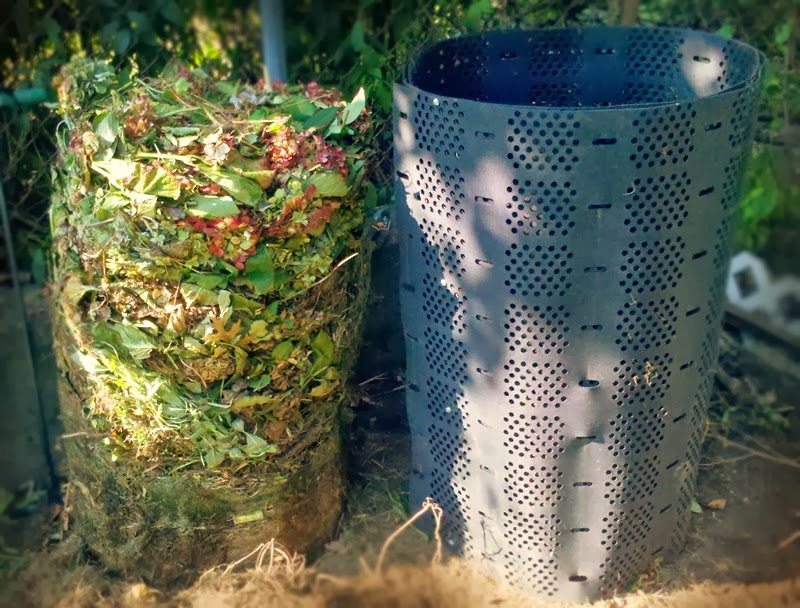 As you press the compost turner into the compost the wings fold, making it easier to get it deep into the compost. When you pull up, the wings unfold, providing more surface area to help bring up some of the plant material with it. The poking alone helps bring air into the center of the pile but the wings help mix up the material to bring composted material out and thus uncomposted material down into the center. From time to time I'll need to add a lot of material to the bin. In those cases I'll actively manage it. Turning it frequently, making sure it has the right moisture, etc. Within a few days the bin will go from full to half full and continue to lose mass as everything decomposes down to less than a foot. At the end of the growing season, after the vegetables are done, the landscape has been heavily pruned, but before the tree leaves really start coming down, the bin is usually full and I need it to be bigger. This is also good time to give the compost a really good turning. 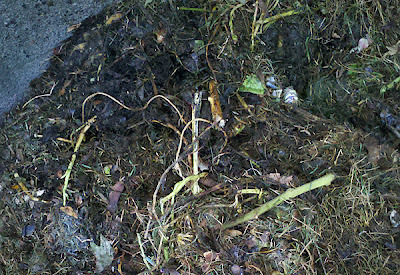 I start by removing the stakes and carefully lifting the Geobin off of the compost pile. If I'm careful the pile will hold its shape. With the Geobin now empty, I can remove the screws, make the Geobin larger to handle the larger amounts of litter that is generated before winter comes. Using a shovel and rake, I start to load up the bin again with the old contents. I start at the top, then the sides. Basically turning the pile inside out as I go. As I work my way towards the bottom foot or so of the pile, in the center I start to see some nice rich compost that has been cooking in the Geobin for most of the season. This gets moved to the top and outside areas of the new pile. Some of it I'll keep off to the side to cure a bit in case I need it for any fall planting. After turning, the center of the old pile is now on the top and around the outside of the new pile and looks like this. Once the leaves start to fall, I mulch mow a lot of the fall leaves into the lawn but I still wind up having a decent amount to compost. I gather them with my bagging mower. This makes it easy to collect them and it cuts up the leaves so they compost faster. Along with the leaves will be grass clippings which help bring up the nitrogen content but I'll also throw in any high nitrogen organic fertilizer I might have left over since the leaves are high in carbon. From here on out I'll turn the pile from time to time with the Compost Turner to keep the pile active. As it gets colder the pile gets turned less often because I really don't like the cold. It's neat to watch the steam rise off the pile as it gets turned in the cold but that eventually loses it's appeal. By the next spring everything pretty much decomposes, minus a few thick stems and twigs that accidentally made it in the pile. This is how I compost, if you do things differently and have any advice, please feel free to leave a comment.